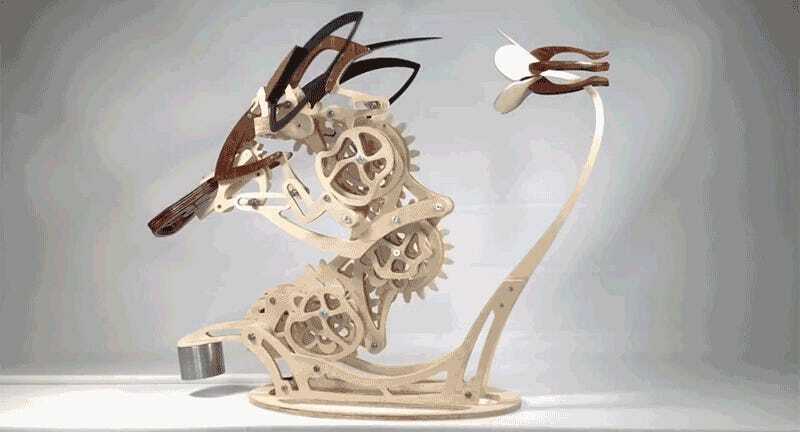 Derek Hugger is a sculptor, but instead of working in an inanimate medium like clay or marble, his creations are marvels of kinetic engineering made from gears, cams, and a complex assortment of moving parts. Hugger’s latest creation, Colibri, is a wooden hummingbird hovering and drinking at a flower that perfectly recreates the intricate flapping motions of the real thing. Every part of the bird, from its wings, to its tail, to its head, are all linked together so that turning just a single crank brings the sculpture to life. Here in lies the rub, though, if you want one of these sculptures for your desk at work, you’re not only going to have to self-assemble it, you’re also going to need to supply your own wood and make every last gear by yourself.